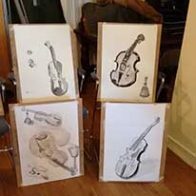 The Mortlake Drawing Group is led by Simon Klein. He is an experienced teacher of both beginners and those who have drawn before. Most of us are better at drawing than we think, this group gives you an opportunity to find this out. There is a free taster session for newcomers to find out more about the Drawing Group.